Marvelous Multiagers! : Holly Bloggy Christmas!! 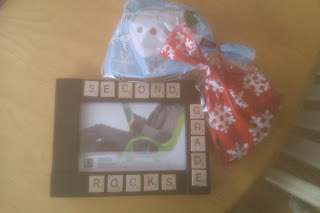 This year I participated in Caitlin and Sarah's gift exchange, Holly Bloggy Christmas! It was super fun to send out a gift for another blogger and to receive one in the mail! Andrea sent me a lovely array of gifts! If you're reading this, let me know if you have a blog so I can link to you! I got... glittery J and D ornaments for my name, chocolate covered pretzels (not pictured because I devoured them, haha! ), white fudge covered pretzels, Santa and reindeer window clings, a Target gift card, and a whole bunch of peppermint patties!!!!! My fave!!! Thank, Caitlin and Sarah, for organizing this awesome exchange!!!! Such cute gifts!!! Wish I knew about the party!!! 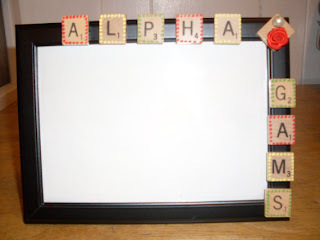 What a cute idea with the frame - I will have to Pin that! Andrea!!! If you come back to read this, I LOVED your gifts!!! They made me so happy. I am not crafty at all, I totally stole that idea from my cousin and hers is clearly way cuter than mine, haha!! Thanks for posting your pics! It's so fun seeing what everyone got and sent! Thanks for participating!